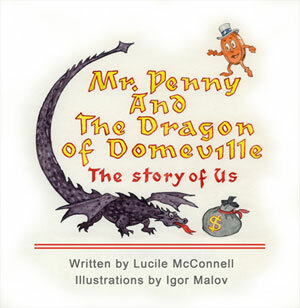 Mr. Penny and the Dragon of Domeville: The Story of Us is available NOW for purchase at www.balboapress.com and all proceeds go to retire America's National Debt! Mr. Penny goes to Congress! LOCAL HEROES ROLL DOWN AMERICA'S NATIONAL DEBT! MR. PENNY LAUNCHES THE BILLIONAIRE NATIONAL DEBT MATCHING CHALLENGE! THIS JUST IN! MR. PENNY THROWS UNCLE SAM'S HAT INTO THE RING AND DECLARES HIS WRITE-IN CANDIDACY FOR PRESIDENT OF THE LAND OF US. MR. PENNY PLEDGES TO SAVE BIG BIRD, LADY LIBERTY AND THE LAND OF US, TOO!